The scientific drive towards combining and aligning data from different facilities in order to comprehensively study multi-messenger and transient events requires interoperability between hybrid data streams with unprecedented time synchronization across locations. 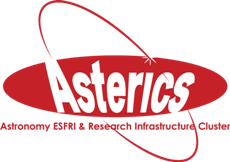 ASTERICS goal is to develop a real-time logistical platform and key synchronisation technologies that will enable a true multi-messenger and transient approach. We upgraded WR with a low jitter daughterboard and a phase locked oscillator. This way time and frequency are transferred in a stable way from a single reference clock to multiple clients in a wide-area fibre-optic network. We adapted WR to enhance data bandwidth for large amounts of data that will be produced by instruments like SKA and CTA. More than 500 Mb/s of reliable data throughput was achieved while synchronizing over the same network to a fraction of a nanosecond. We did a setup of a hierarchical WR network to get a high relative timing precision between different telescope cameras. We used 32 WR timing nodes to mimic 32 CTA telescopes. Many instruments are in remote locations and operate under harsh conditions, such as extreme temperatures and drought. A good place to study the stability of WR hardware in long-term exposure to harsh conditions is Siberia. The currently used network protocol (TCP) stems from a time when data files were small and collaborations were not as global as today. A new tool using another protocol (UDP) was written to allow for faster transport of large data sets.